— Hello, everyone! This is ICO Talk. Today my guest is Ruslan Tugushev, CEO and founder of the Storiqa project. Ruslan, Hello, thank you for your time. — Ruslan, tell us, please, about your project, what it is? How it works? — Storiqa is not something revolutionary. People often expect Blockchain projects to be revolutionary. This is a project that uses Blockchain technology. It uses not so much the Blockchain, but all the advantages of the Blockchain technology. We use them in the classic big business, practically the largest one on the Internet –E-Commerce. We use all the innovations and everything that came up with Blockchain in the E-Commerce market. This is a large pool where we integrate. In our project there are five points of implementation of Blockchain technology. I’ll tell you about them step by step. The first one is a guarantee for the buyers. There is an interaction between the seller and the buyer. For example, if we take a standard marketplace, some leaflets, or ad boards, it is quite difficult for us to trust the seller if we do not know him, especially if he speaks a different language, and it is not clear at all whether there is such a product that I wanted to buy. Yes, there are large marketplace or shops that guarantee the quality of the goods or the return of goods, but it all happens with the goods produced on an industrial scale: electronics, books, clothes that are produced by well-known brands. In such cases, the sellers guarantee a refund. However, if you’re dealing with small-scale producer from another continent, there are almost no such platforms. There are some projects similar to Storiqa. Some of them has the same features that we offer, but mostly no one does it in full swing. We have the guarantees. Due to the smart contract, the system is transparent and safe. All data is kept with smart contract until goods are delivered to the buyer. In the middle of transportation, we act as a center of qualification checking how much the goods correspond to the description on the product card. 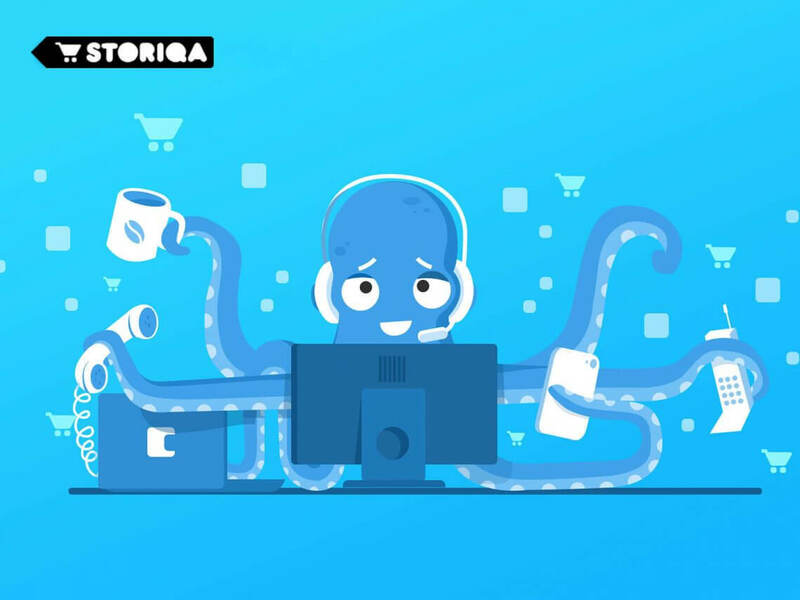 We work in the following way: before sending the product to the buyer, the seller delivers it to the center of qualification Storiqa. We open it; look how much it corresponds to the product card. If the product corresponds, then we put a mark in the delivery chain that it corresponds, and the seller is a responsible person. If something happens as a result of transportation, it is no longer his responsibility, it is the responsibility of the logistics companies with whom we will deal in terms of money return. As a buyer, you save a huge amount of time. If something like this happens on AliExpress, you will get your money back, but you will lose 3 weeks. For example, you can order a costume for Halloween, it will arrive 2 days before the Halloween, you will open it, and there will be a different size or other color. Yes, you will get the money back, but the Holiday will be spoiled. In our case, we will check this even before the product is delivered to you. If it does not match, we immediately return the incorrect goods to the seller and let you know, as a buyer, that the goods do not correspond to the description, so it is better to order something else. We also give a negative assessment to the seller that provides poor-quality goods. The lower the rating, the more the buyer will see that if he orders, there is a chance that something goes wrong. We also provide the tracking code, so you can see at what point the product is on the way to the destination point. Once the product is delivered to you, you are given the box in hand, smart contract is triggered, and the money is sent to the seller. The seller received the money. However, you will have another 14 days to open the box and check the goods. If, suddenly, something bad happened with the goods during transportation (it was scratched or crashed), you can initiate a dispute, and we will refund the money. We will independently deal with the logistics company on what went wrong. All products, which will pass through the platform, are insured. Therefore, to a greater extent, insurance companies will compensate for damage to goods. Thus, the buyer gets refund, seller increases profit, logistics company gets money, and insurance company will pay Storiqa if something bad happens. — You mentioned that Blockchain is implemented at several points in your project, isn’t it? — Yes, first point: logistics and payment. The second is that we see increasing demand from sellers for services of new media such as bloggers or mass media, which conduct their activity completely on the Internet. These people collect huge audiences. Instagram of some people is already more influential than the largest TV channels. Therefore, these people have the opportunity to generate demand from the audience. Virtually all marketplaces are now built for people who come with a specific request. Let’s say that you have a specific desire to buy a phone that comes out to the market on November 3. You are looking for the store that will deliver it to you faster and cheaper. The majority of goods sold on Storiqa has no clear and strong demand. Usually, the demand for these goods arises after an influencer or some group of people begin to use this product. For example, it could be some red galoshes, which became very fashionable after one blogger has started to wear them. We create a platform inside Storiqa for influencers to whom we provide the opportunity to order from the platform free-of-charge and test them. If they like them, they can tell the audience about this product and give them the link on its purchase. The influencer will be able to get the product and test it free, but also get a very good profit in some percentage of those goods on Storiqa. For sellers, this is a new ever-expanding channel. It’s not quite free, but we give the opportunity to test the product and tell a huge audience and share some of the sales profits with the opinion leader that helped us. This platform is also built on Blockchain, where you can clearly see how many people have passed, clicked, bought. This is the second part – the interaction between the seller and the owners of traffic. The third are payments in standard crypto-currencies, Bitcoins, Ethers and all the rest. There are already more than 70 currencies, which are converted well in several pairs. This is the third. — Will you accept fiat money too? — Yes, fiat too. We perfectly understand that cryptocurrency is rapidly evolving, but many people have not got used to it yet. Yes, they can use credit cards or other digital electronic money. We will work with fiat money. The rate for fiat money will be very low. We assume that the commission rate for the shops will be approximately 2.9%, which is less than the offer of AliExpress or Amazon. We have a reliable bank partner which offers us good terms. Thus, we spread these terms among sellers on Storiqa. Everything will be fine with fiat money. The fourth part is our interaction as a platform with our investors. The fourth part of the implementation is the interaction with the investors’ community. All companies’ statistics including number of shops, average bills, quantity of orders and delivery will be available to owners 24/7. We are totally transparent to investors. If you have STQ token, you will be able to get all companies’ indicators. You see all the company business indicators, and you can decide whether to buy or sell tokens on the exchange not just at the level where the wind blows or what the chat said, but on real indicators. — Let’s turn to ICO. Why do you conduct ICO? What the Hardcap is? — We have now completed Pre-ICO. We had Pre-SELL and Pre-ICO, as a result of which we collected 4426 Ethers, which is about 1300000 dollars (I do not know what course is today). We did it in 5 days. About 400 people participated in our Pre- ICO. We have tasks for Pre-ICO and tasks for ICO. On Pre-ICO we needed to check the team, how much we are ready for the main ICO, where we have weaknesses and how we can strengthen those things where we did not have enough time to do. It was hard enough for us to work with the community. We are working on it now. We did not understand everything from the point of view of the Legal, and some of our potential American investors did not participate in the ICO because they are waiting for us to clarify the conditions for them, so now we are working on it. We test the sources of traffic, where and what countries, what they react to and work with the community. First of all, it was important for us to understand how clearly we can express our thoughts with words and bring them to our community because they do not understand what we want to do, what mountain we are going to, and what we want to do. — What are the goals for the ICO? — As for ICO, we have more fundraising goals. Now we are adjusting our goals with our consultants and will announce our Softcap and Hardcap within 2-3 days. Roughly, in our average cap we are targeting $ 25 million. Accordingly, Softcap will be slightly lower, Hardcap will be slightly higher. How much higher, how much lower–we will announce in the next few days. As a result, we received 1.3 million on Pre-ICO. — Why do you need money? What are the main stages of the company’s development? — We have finished platform at 80% and do our best to launch the New Year sale by the end of this year from 18 December to 25 December with a limited number of goods. We will try to put some things for sale. However, we will do this in case we are 100% sure of the working capacity of the platform. Therefore, we need money for the product. Maybe in 2-3 weeks we will open the doors for all shops that want to introduce themselves to Storiqa. We will check ourselves, how we cope with a flow of goods including packaging, reviewing with photos and videos, copywriting and so on. For all these steps, we use money from Pre-ICO. This is quite a large amount. It will go to several markets such as Asian, American, Brazilian, European, South Korean, Chinese markets. We are already beginning to develop these communities and are going to be present immediately in all major markets, where we are going to work with investors, shops and buyers. — As for Pre-ICO, where are the investors from? — Our home market is Russian. About 40% of the money was from Russia, the rest was from all over the world. We are only preparing for the main ICO from the point of view of Legal on the Chinese, Japanese, South Korean, American markets. Our home market is now the largest, 40 % is Russia. We plan to attract approximately 60 % of the ICO from the North American market, 20 % from the Asian market and 20 % from the rest. However, from our region, as I think, we will have from 5 to 10 %. — What do you think about the development of the ICO market in Russia? What is your opinion about its prospects? — I think the guys, who are doing it now, before the introduction of any regulation, will be able to move forward in 2-3 steps. It’s all as long as there is an opportunity to attract capital to the format when you can be absolutely transparent for investors, at the same time leaving 100 % of the company management behind you, and leading it only to where your vision is going. This is a unique opportunity for entrepreneurs as they can consult cool advisers, but have the right to choose where the company will go. You do not have a limit in terms of how fast you can move. The companies, which take money from ICO, develop more quickly than what the share capitals because the level of decision-making is much faster. In standard diagram of management, you need to gather Board of Directors, wait till everyone makes decision, sign pieces of paper, or even wait till some of them come back from vacations, and only after that things are done. — It’s clear. What about your cool advisors? Tell me about the team in general. — We do not have our own cool Board of Advisors yet, but we are working on it. Now we have cool Russian advisers in E-Commerce such as Sergei Fedorinov, the former CEO and founder of the Video market, the largest marketplace and E-Commerce company in Russia, which is among the top 10 European companies. He advises us on how to build logistics properly, which points and metrics should be used for E-Commerce companies. We are now more involved in the interaction with the community. During preparation for Pre-ICO for a month and a half, our White paper has grown by 3 times in size. Now it is already 37 or 39 pages, and it is growing constantly. We listen to the community. I do read all the messages in both our English chat and our Russian chat. Now we will also have Chinese chat. It will be more difficult for me, but the Google translator will help me. — How big is your project team? — There are 15 people in our team. I work together with Zhenya. We have marketing specialists, who are engaged in traffic, 3 PR specialists, 5 developers, some project people, designers, community. Well, about 15 people in total. — Let’s have a look at a negative scenario. If you do not even collect enough money for the Soft, what will happen to the project? Will you seek other sources of funding or close the project? — Before joining this conversation, we were thinking about these questions, and organized some meetings. We found a demand for our project from the venture capital owners. We persuade them to get tokens instead of shares of stocks. They still do not fully understand and are afraid, as it’s a bit new for them. They like to sit on the Board of Directors, discussing and establishing a bunch of terms which you can and which you can’t do. In fact, we have enough funds to develop on the local market right now. What we collected on our Pre-ICO and what have been invested by early investors will be enough to enter the local market next year and show some results. Actually, we have very good advisers, and in the near future, we will work with major investors from the United States. Now we also start to work with major investors from the Post-Soviet space, Chinese and Indian investors. I think that Softcap will be attracted for short enough period. A question is whether we can collect all Hardcap or we cannot reach it. We set the task to launch the ICO only after we clearly understand that we will collect enough money. — Tell us about your tokens. How can you use them? What are the main advantages for investors? — We have five implementation points for token. First, token is the most profitable mean of payment inside the platform. It gives no commission for sellers and buyers. Transactions with tokens will be without commission on the platform. Many people ask: «What happens if Storiqa starts to grow by 10 times? Will it be 10 times more expensive?» The system is organized as follows: the seller sets the price not in the cryptocurrency, but in fiat money; the system automatically does online calculations of how much it will cost in the cryptocurrency. At the same time, he can always set separately the price in STQ because it is with STQ that he will be able to pay for the internal services of the platform. All that will be sold for the shops inside the platform: placement of goods, payment of commissions, call center services, marketing, packaging of goods – all this is sold for STQ. Therefore, there will be a constant demand from the shops. According to our forecasts, the turnover of all prices will be done in STQ tokens for 2-3 months. Third, as I already told, the opinion leaders will be able to receive STQ and exchange it already in their local region on other currencies: Either, Bitcoin, dollars, or others because cross-border payments make communication between people difficult. If the opinion leader is in Brazil and seller of felt boots is in Tyumen, it is difficult for them to carry over transactions to each other. If we convert this into any cryptocurrency: Bitcoin or STQ, it becomes easy. It is important that the coin is convertible and available on many of exchanges, and it could be exchanged for its own money. This is the third part. The fourth is fairly large communities that will help us adapt the product to the region, so they can earn money on the platform. They will promote it in the local markets. For example, there is a specific separate dialect of the Indian language. If people pass certification, they will be able to translate the product descriptions into their own language; they will be able to receive money for this work in STQ. Shops will be able to pay them in STQ too. It is also understandable why it is convenient when there are no interbank payments. You can pay in any currency and not worry about how it works. Everything will happen through STQ. This is the fifth point of integration. — Ruslan, tell us, please, one or two statements on why I should invest in Storiqa. — Here there are two variants. The first is if you are potential shop that wants to place its products somewhere. In fact, you can now buy tokens 10 times cheaper. In 2-3 months, you can use the services of the platform, and they will be 10 times cheaper, because for shops, the cost of 1 token will be sold for 3 Cents already on the platform, or tokens will be purchased on the exchange. Now, we sell the token 10 times cheaper because it is on sale at the price of 1 Ether (300 dollars) for 100000 STQ. As soon as there are shops in demand for the platform, the price will be 3 Cents. They can buy also in the open market. In the open market if somebody wants to sell tokens for 2 Cents or 1 Cent, it will be certainly more favorable for them. Our task is to maximize the number of stores that will create constant demand to make the price close to 3 Cents, maybe even more. Well, if you are an investor, you can buy the goods with discounts or wait for the demand. If you want to earn, your task is to wait until the number of shops on the platform reaches the point when a level of the demand will be equal to the proposals from investor. Only then it makes sense. — Ruslan, thanks for the great interview. Previous Post How-To Invest in ICO?